Don’t know what to do with your leftover Thanksgiving or Christmas Ham or Turkey? 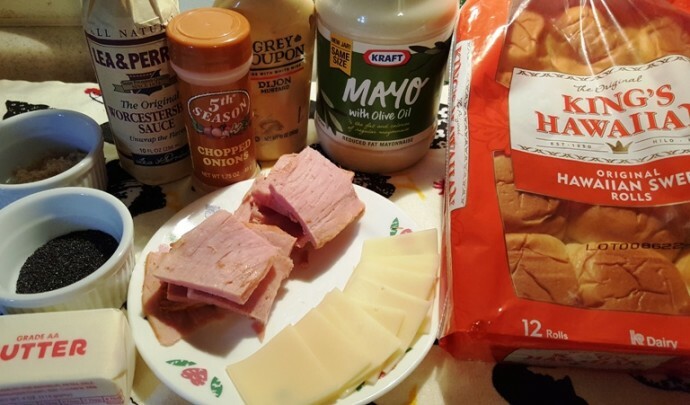 Make these delicious Holiday Party Ham Buns Southern Baked Ham Cheese Sandwiches. Don’t know what to do with leftover Easter and Holiday ham? How about some Ham or Turkey Buns? In 2003, I up and left my beautiful house in Tarzana, California. I discovered after moving that all I needed was a vacation, not a total Coast to Coast relocation. It is a decision I regret to this day. I loved my townhouse so much. It was huge and beautiful and I loved my wrap around balcony. I used to stay out there forever and just look out at the Valley and the beautiful mountain and hills and enjoy living in beautiful Southern California. This was before the real estate craziness and before investors took advantage of the market and made owning a house a luxury, rather than a necessity. Now, unless you are in the 1%, you can’t touch that area. Ugh, what a mistake. My travels took me to Charleston, South Carolina and it is a charming and beautiful City. 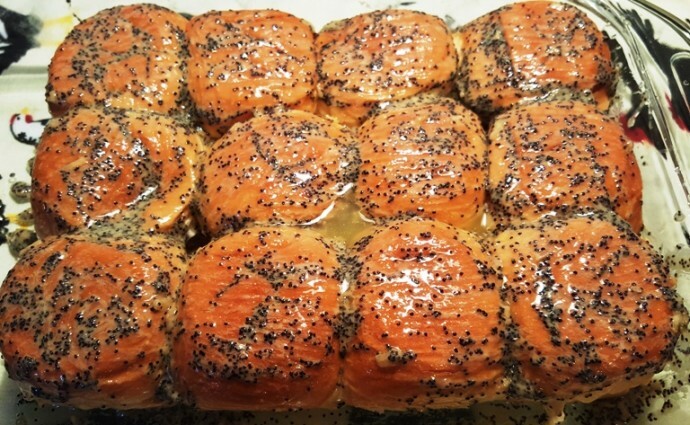 I learned all about “Ham Buns,” and a party gathering was not complete without Ham Buns. In Miami, where I am originally from, the Cuban Bakeries have Ham Buns, that are similar and equally as delicious. Be on the lookout for that recipe. 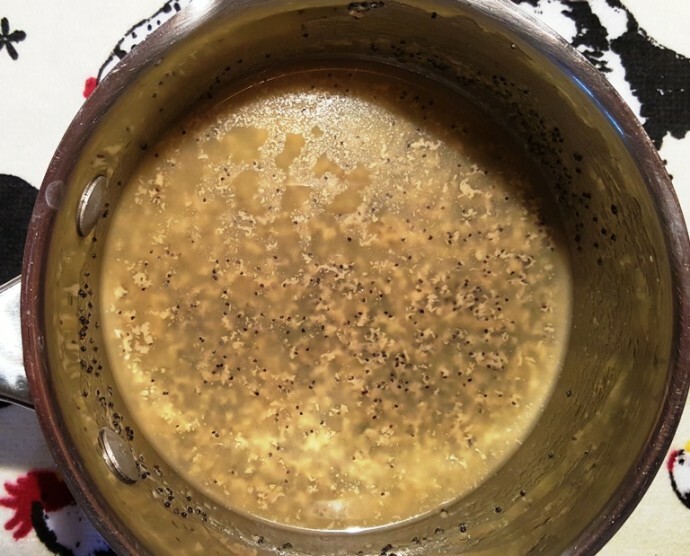 Another yummy recipe for leftover Ham Bones and Ham is my Pressure Cooker Split Pea Soup. 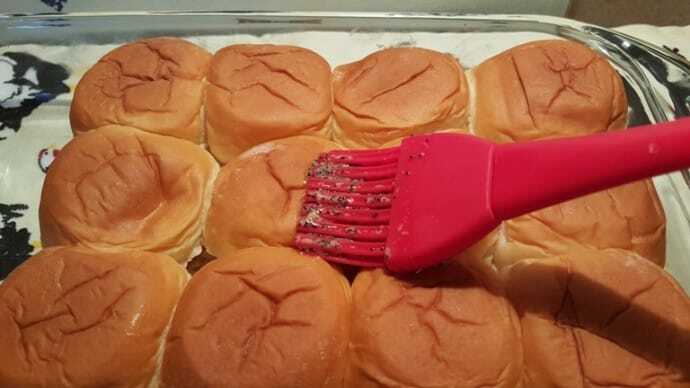 Carefully, slice the whole bag of Kings Hawaiian Buns in half and place the bottom half in a Pyrex Baking Dish. This looks like a plain ole ham and cheese sandwich, but it’s not, just wait! Smear a thin layer of Mayonnaise on the bottom Buns. 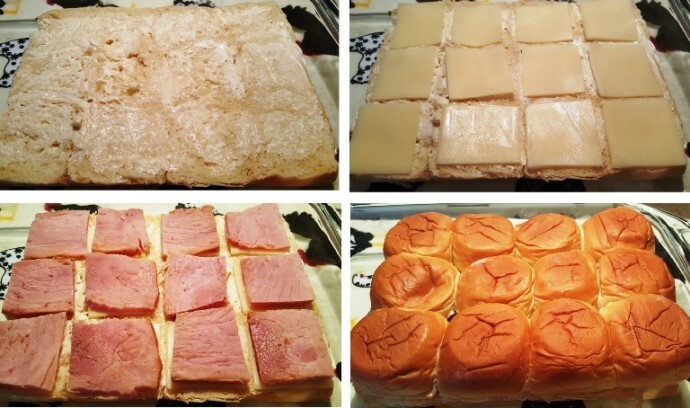 Divide the Ham among all the Buns. Then divide the Swiss Cheese among all the Buns. Smear another thin layer of Mayonnaise over the inside of the top Buns and then place over the Ham and Cheese. Wait, there is more. 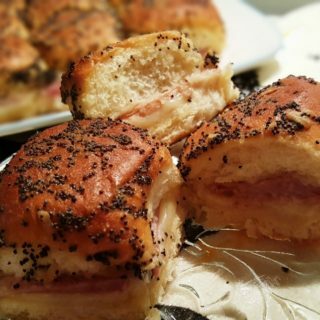 The deliciousness follows and transforms an ordinary Ham and Cheese Sandwich to extraordinary Holiday Party Ham Buns Southern Baked Ham Cheese Sandwiches. In a medium saucepan, melt some butter. I like to use my stove, but if you want to nuke it in the microwave, do it slowly, in increments of 10 seconds. Remove the Saucepan from the heat. Whisk in the Worcestershire, Dijon Mustard, Minced Onions, Poppy Seeds and more. Make sure the Sauce is well combined. Whisk until all the ingredients are completely combined. Make sure the buns are tightly together, next to each other, so that there are no gaps. Brush the sauce all over the tops of the buns and let some drip in between the buns. The Sauce will Soak into the Buns – Delicious! Doesn’t that look delicious!!!! This will soak into the Buns and be so wonderful. 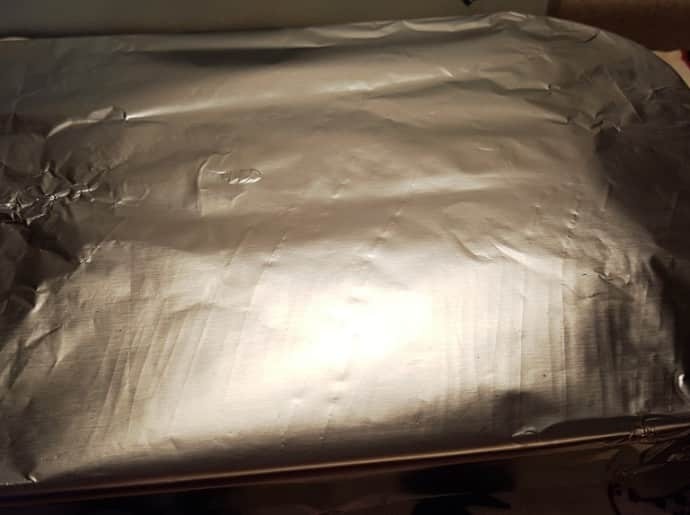 Cover the pan with tin foil and put into the refrigerator overnight. The Holiday Party Ham Buns Southern Baked Ham Cheese Sandwiches taste best if you prepare them the night before you need them. If you can’t wait and want them right away, let them rest at least 30 minutes prior to baking. I know they are hard to resist. The longer they sit, the more the Sauce seeps into the Buns! Take them out the next day and then pop them in the oven for 15 minutes, covered. Sprinkle a little Brown Sugar over the top and pop them back into the oven for just a few minutes. Keep an eye on them, as you don’t want the Brown Sugar to burn. The Brown Sugar should just melt in, slightly. Yum! 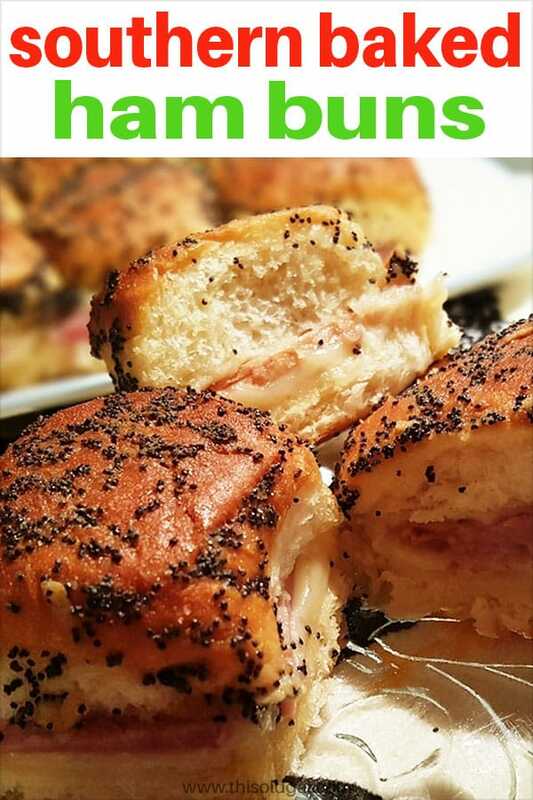 You won’t believe how good these Holiday Party Ham Buns Southern Baked Ham Cheese Sandwiches are; there are no words! Must try NOW! Serve with my Picnic Potato Salad or Orange Ginger Cranberry Sauce on the side. 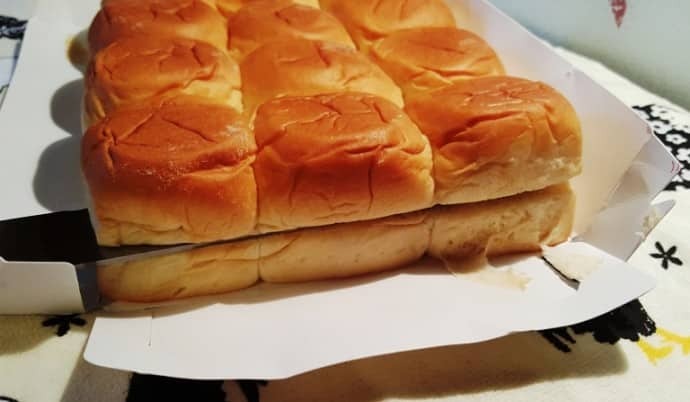 With a sharp bread knife, carefully cut the rolls horizontally in half, making sure to keep the bottoms attached to each other and the tops attached to each other. Place the bottom half into a 9x12 baking dish and spread with 1/2 of the mayonnaise. Divide ham over bottom half. Divide cheese over bottom half. Spread mayonnaise on the inside of the top buns and place on top of the bottom buns with the ham and cheese. 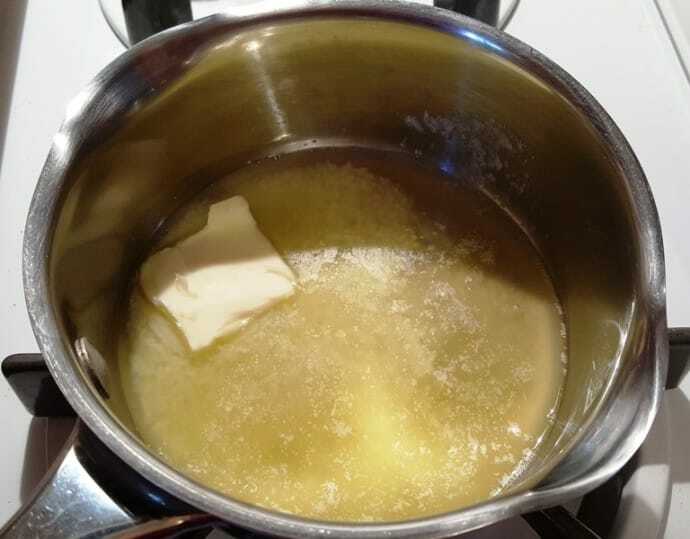 In a small saucepan on low, melt the butter and then remove from heat. 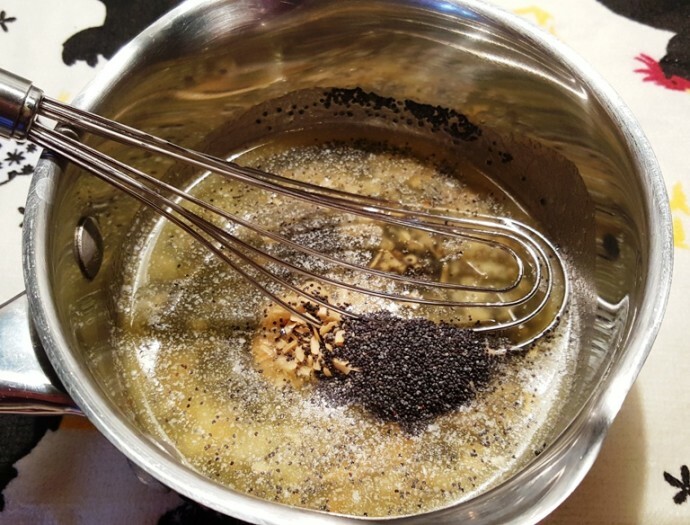 Whisk in the mustard, onion flakes, Worcestershire and poppy seeds. Brush sauce over tops of rolls. Cover with foil and let sit on the counter for 30 minutes, or overnight in the refrigerator. Bake at 350 degrees for 15 minutes, or until cheese is melted. Uncover and sprinkle the brown sugar over the top and place back in oven for 5 more minutes, or until the top buns are slightly brown. Serve warm. This can be prepared the prior day. 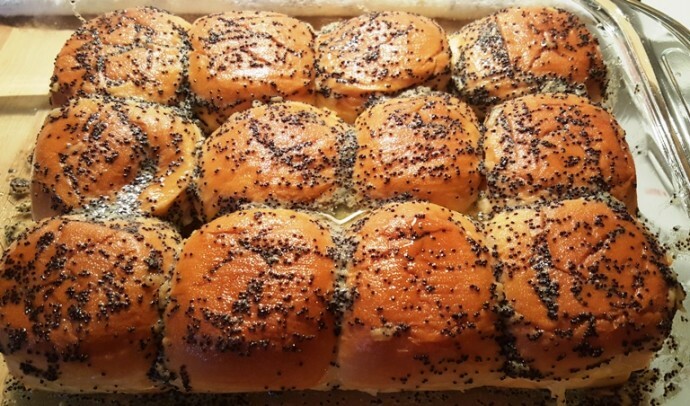 After covering the buns, place in refrigerator overnight. 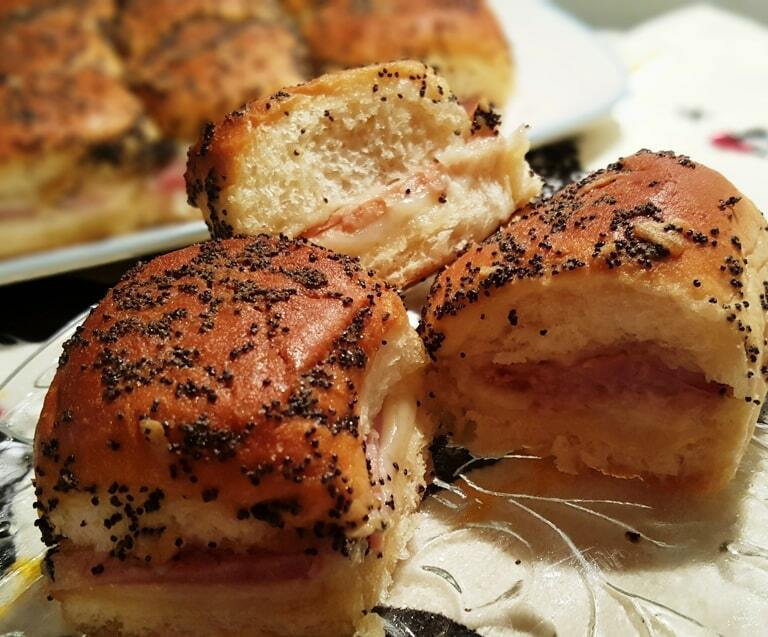 PIN this Holiday Party Ham Buns Southern Baked Ham Cheese Sandwiches! TThese look so good. I have a heap of ham to get through. And a bone for some pea soup which I will probably freeze for later. And ham and pickle salad for sandwiches. By the middle of the week I’ll be looking for a meal featuring anything but ham. I made these for a Christmas party this year and they are excellent. 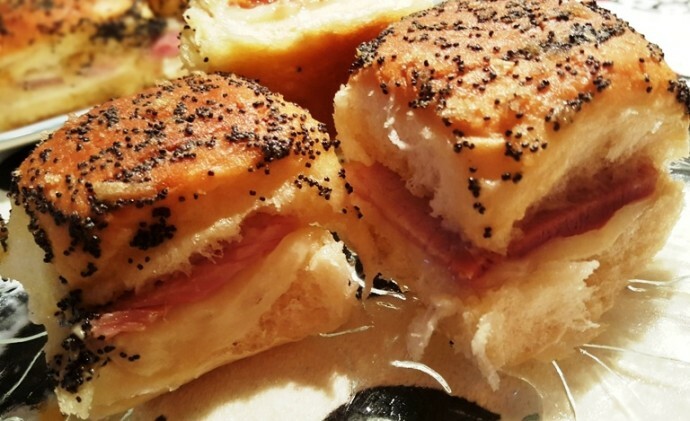 Several cooks who have made ham sliders before said this was the best recipe they have tried.